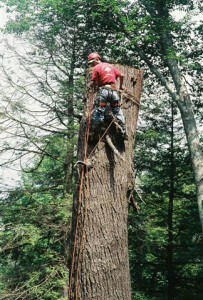 At Hunter’s Tree Service, Inc. our professionals have years of experience in tree care. We can properly evaluate whether or not you need to remove a tree on your property. The cost for tree removal services are quite affordable when you consider the money that you will save by removing a diseased, dead, or hazardous tree prior to it causing harm or damage to your home or other structures on your property. Trees may become weakened by age, disease, pests, or storm damage. They begin to rot from the inside out and look perfectly healthy in the beginning stages of decay. Such a hazardous tree can break apart, split, or fall down in an instant. If you have questions about whether or not to remove a tree on your property, we advise you to contact our professional arborists to meet with you todiscuss your options. We incorporate the highest standards of safety in our tree removal process to ensure that both our staff and that the structures on your property are safe. We have been removing trees for years and know the precautions to take to make sure a job is carried out smoothly and efficiently. Sometimes we may use a crane or bucket truck to remove a tree, and we have the knowledge to carry out the use of these pieces of equipment. Contact us to discuss the removal of a tree. If it needs removed, we take into account the size of the tree, location, and accessibility to determine what equipment we will need in order to safely remove the tree. Our professional arborists are always ready to help you make a decision regarding your trees. We work throughout the High Country!